I posted these pictures on twitter a while back but didn’t get around to putting them on the blog until now. I’ve been working on this quilt for a couple months, it was my first large project and a wedding gift for friends. I used some of the 1 1/2 inch precut strips and additional matching fabric and then it was machine quilted by Laurie Roberts in San Jose. I can’t find the receipt right now so I don’t remember how big it is, but it’s a large throw. I made 9 patch blocks from 4 patch squares of the precut strips, alternating with a print square. 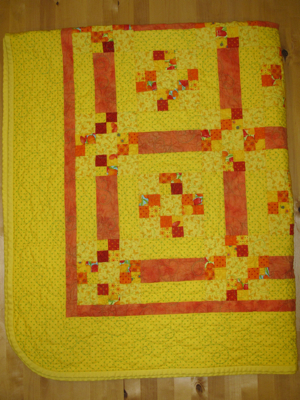 The other block is yellow with an orange stripe, arranged in squares. The orange stripe and border was from a surprise box stash and it worked well. 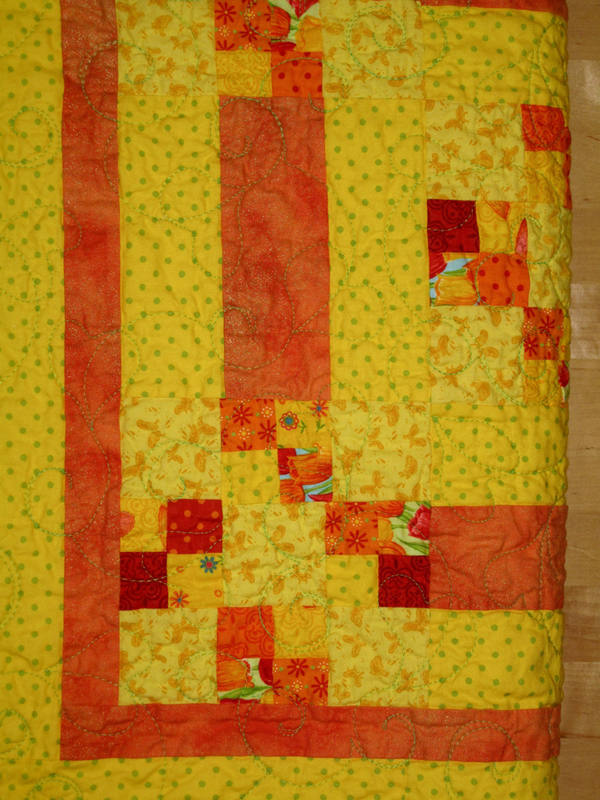 Originally I was going to do the border in red but I did a test block and the orange just looked much better. I have a few of the 9 patch blocks and some of the other fabrics left to use for another project. The quilting is in green to match the dots in the background fabric and it was done in a meandering heart-shaped leaf. This entry was posted by feorlen on Sat 31 October 2009 at 17:55 under quilting. Tagged 4 patch quilt, 9 patch quilt, pre-cut fabrics. You can leave a response, or trackback from your own site. Follow any responses to this entry through the RSS 2.0 feed.